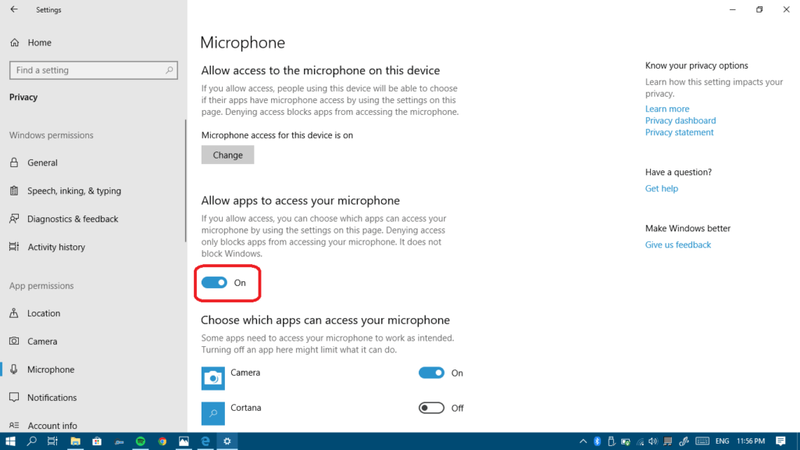 In this guide, we will talk about one of the biggest issues in Windows 10: the microphone issue. 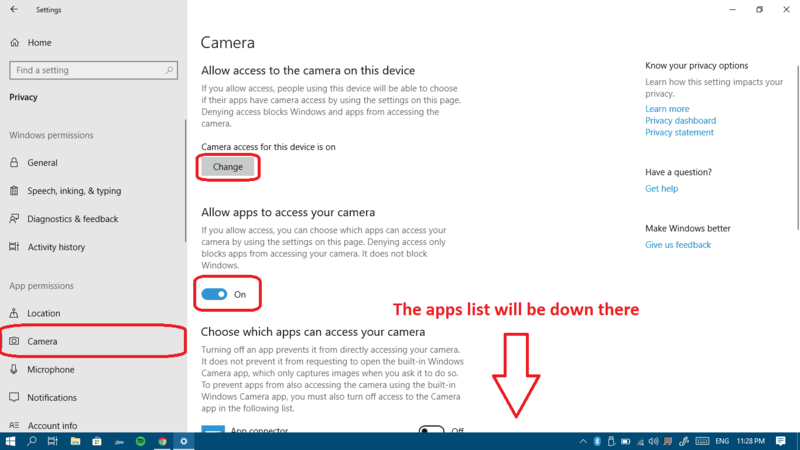 In general, Windows 10 doesn’t work easily with many recording devices, even if they’re built in to the computer. 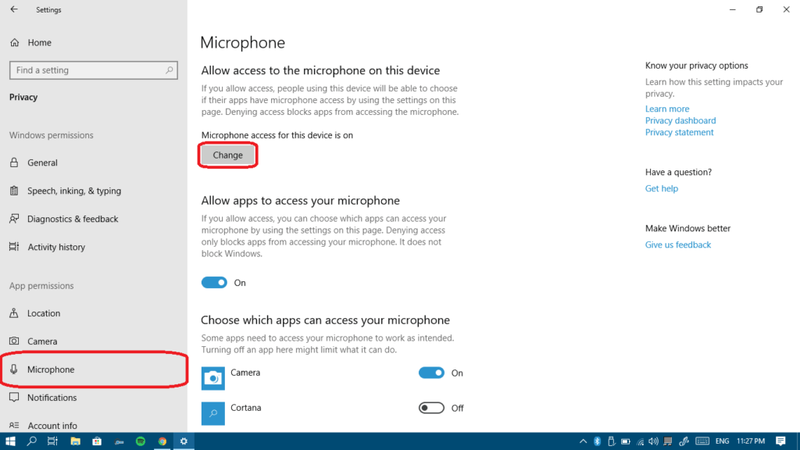 What we’ve found through our experience is that if a mic connected to a computer isn’t working it’s usually a settings problem, and not a problem with the microphone itself. If you don’t have any problems just yet – you just have a new microphone and you are unsure how to install it – check out our microphone installation guide. Click on Privacy in order to access all your privacy settings. Now, turn on microphone for this device. Finally in the app list, make sure to turn on microphone access for every app you want to give permission to access your microphone. Repeat the same exact steps but for your webcam this time. Let’s check that your mic isn’t damaged or faulty first and get that out of the way. 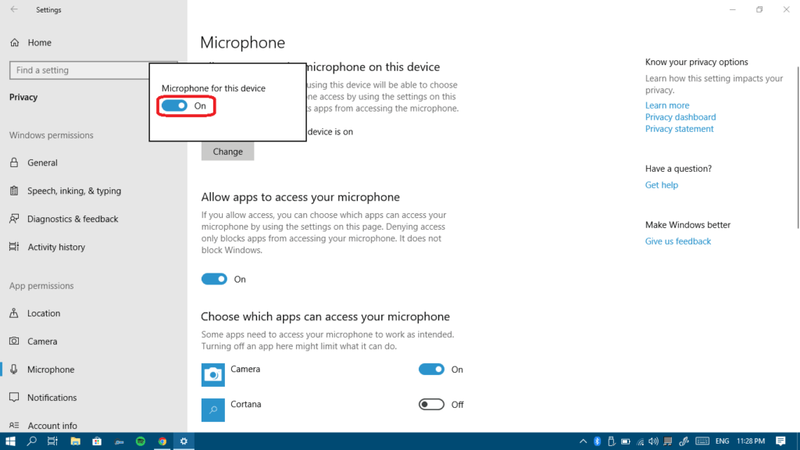 The best way to check that is to connect your microphone to another computer running any operating system other than Windows 10. If the microphone doesn’t work on the other computer too, that means it could be faulty. 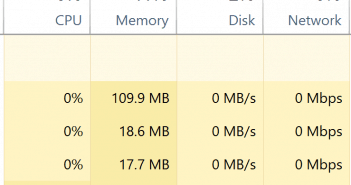 If it does work on the other computer that means you probably have a software problem on your Windows 10 computer. 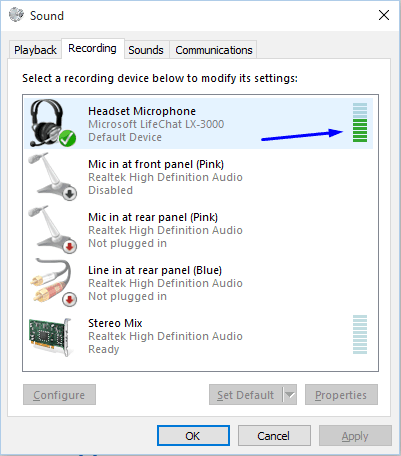 On both PCs, if you’re using a desktop computer (not a laptop), make sure you’re connecting your microphone or headset to the back panel of the PC. The front audio ports aren’t always well connected to the motherboard. Now that we know that it is a software problem, let’s get it fixed. And finally if you’re having problems with a Bluetooth headset / pair of headphones / microphone, then check that your Bluetooth is correctly configured first, with this article. If none of these links above are relevant to you, keep reading. Click on the Recording tab in order to see your recording devices list. A list of recording devices will appear. Try speaking into your microphone, and see if there any green bars rising next to one of them while you talk (as in screenshot). If you don’t see any green bars skip to step 5. If you do see green bars when you talk into the microphone, but it still doesn’t work in some program, then that means that the mic is correctly configured in Windows, but the program is listening to the wrong recording device. Try changing that program’s settings. Check again if you see green bars rising when you talk into the microphone. If you do your mic is now correctly setup. If not, continue to next step. 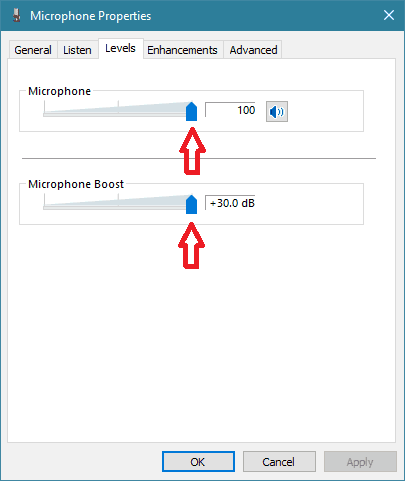 In the “Levels” tab make sure that “Microphone” and “Microphone Boost” are set to the maximum, you can do that by sliding them to the right until the first one shows 100 and the boost is set to +30.0 dB. Then click OK.
Now visit the “Advanced” tab too and make sure to uncheck the “Allow applications to take exclusive control of this device” checkbox and click “OK“. 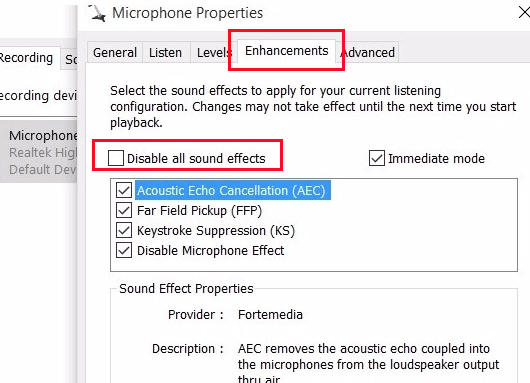 (Also uncheck the “Enable audio enhancements” check box if found). Restart your computer and recheck your recording devices panel. If you see green bars rising when you talk into the microphone – your mic is now properly configured! If you still don’t see any bars and you’re not 100% sure which one of the devices is the relevant one, try following steps 4-11 for every device on the list. 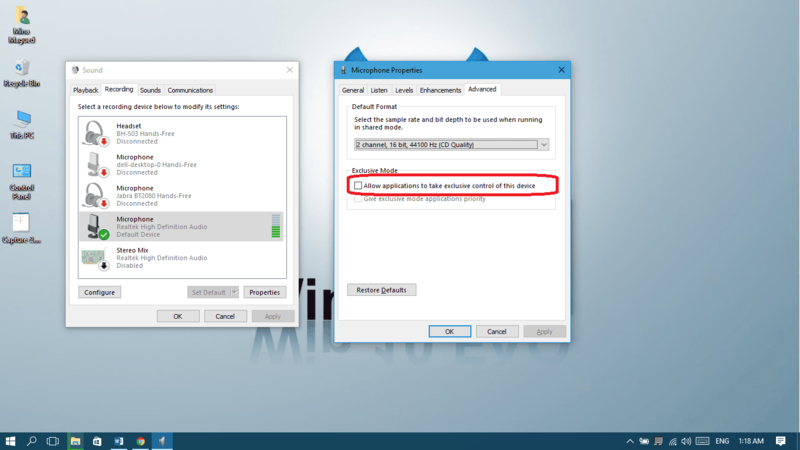 Reconnect microphone and let Windows re-install the drivers. 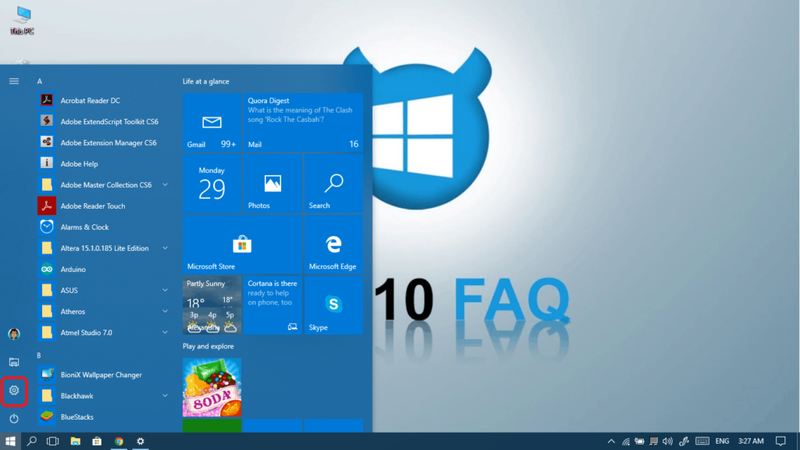 If your Windows 10 updating gets stuck, this may prevent you from getting the latest drivers automatically. Check this guide to fix it. If it didn’t work, I would suggest that you install the latest driver found on your computer manufacturer’s website manually, because sometimes the latest driver isn’t the one compatible with your computer. 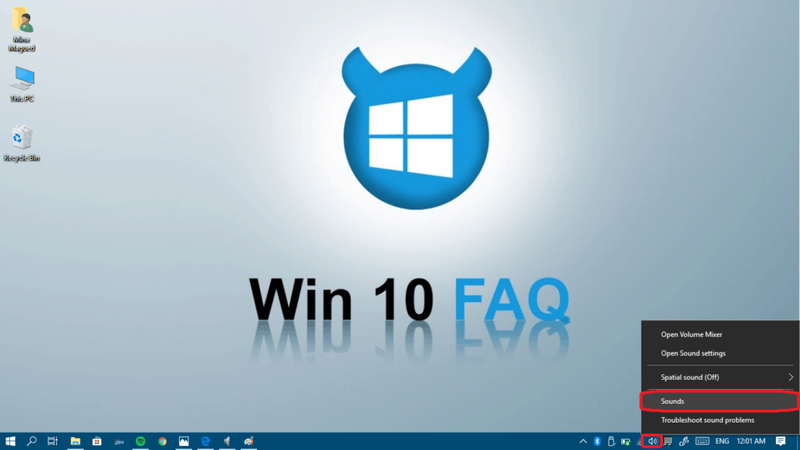 So you should search for your computer model number on the manufacturer’s website, download the latest driver that is compatible with your model number and Windows 10 and check if it works. If you found your computer model on the website but can’t see a version for Windows 10 there, this means there aren’t compatible drivers for it yet and you may have to wait until they release some new drivers. Next up are solutions only to specific devices, so if you read up to here and nothing worked, please head to our forum and we’ll try to help. 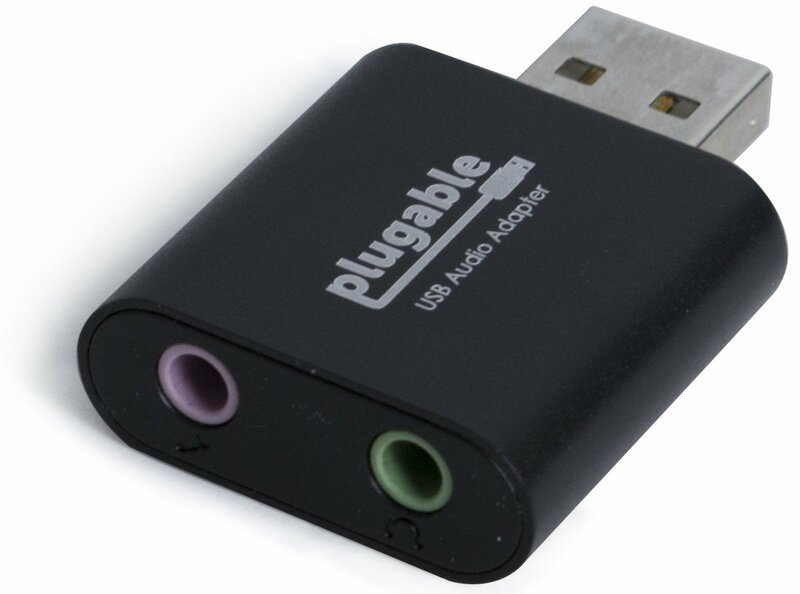 Double click on your recording device ‘High Definition Audio Codec’. Move to the ‘Driver’ tab. 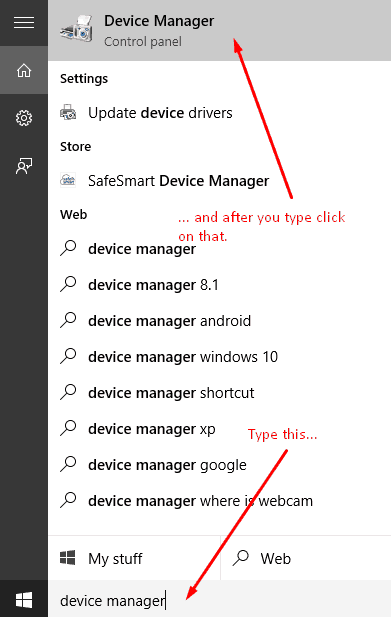 Click ‘Browse my computer for driver software’. 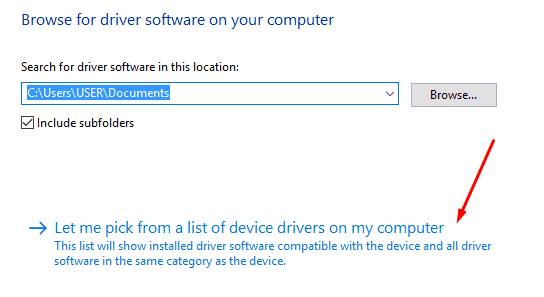 Click ‘Let me pickup a list of device drivers on my computer’. Select ‘High Definition Audio Device’, and not ‘IDT High Def’, and click Next. You will get a warning. Click “Yes”. Many VIA users are experiencing problems with recording and/or playback since they moved to Windows 10. If you’re one of these people try to download and install Daniel_K’s modified drivers. First of all, make sure the connection type between your headset and your computer is the same. 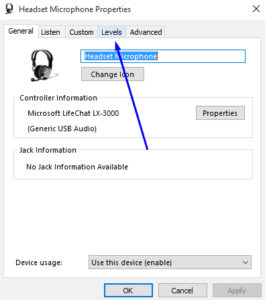 If your headset has 2 independent jacks, one for the audio and the other for the microphone, your computer must have independent ports as well. 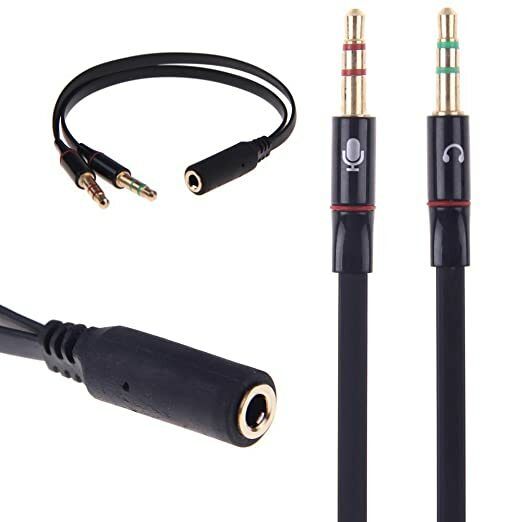 If it’s a 2 in 1 (one jack for both microphone and audio) then you computer must have one single port with a headset icon on it. 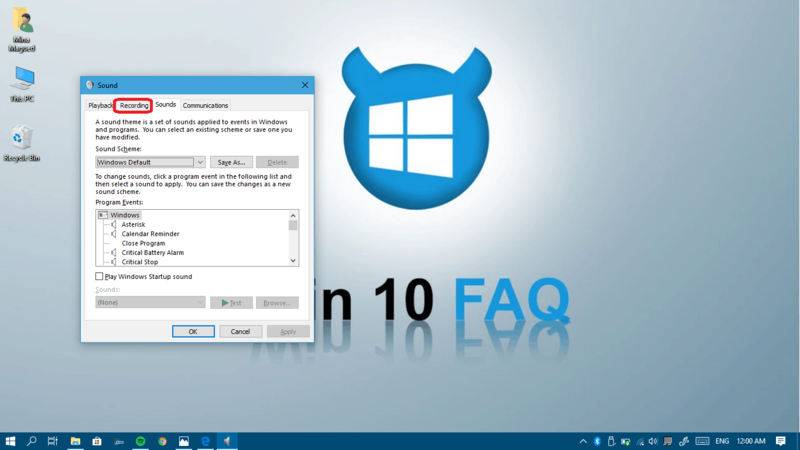 Uninstall any VoIP programs and applications, like Skype, Teamspeak or any other voice calling programs, then restart your computer and if your microphone works again now you can reinstall them. People who use recording software (Audio recording / screen recording) have to check that your software is up-to-date, some people reported that an old version of flashback express screen recorder was muting their microphones. If you still have problems after reading this article and going through the steps, please ask your question in our forum, where we have an expert on the subject that will try his best to help you. As we learn more information through the forum we update this article with advice that is tailored to specific devices. It was the privacy settings for me too. Thanks so much, I knew I had changed a setting, but didn’t even think of going to privacy and checking it out!! Hello Lynn, I’m very happy we could help you. Have a great day! 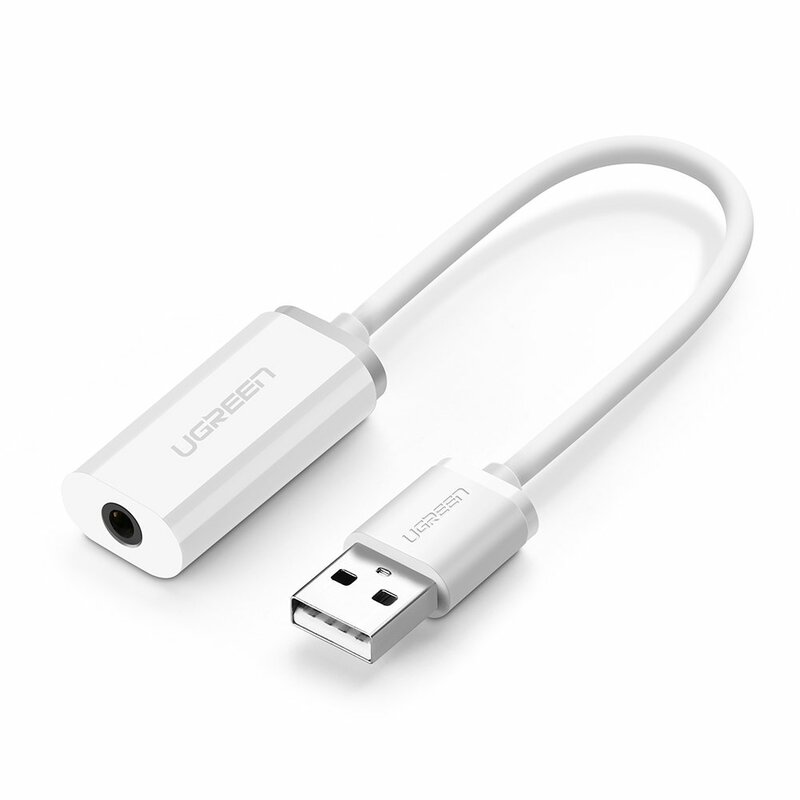 Just a quick recap, so any headphones or earhpones with just one 3.5mm jack wont work for a computer with a mic and aux jack? Id need to buy a splitter? xactely Matthew. 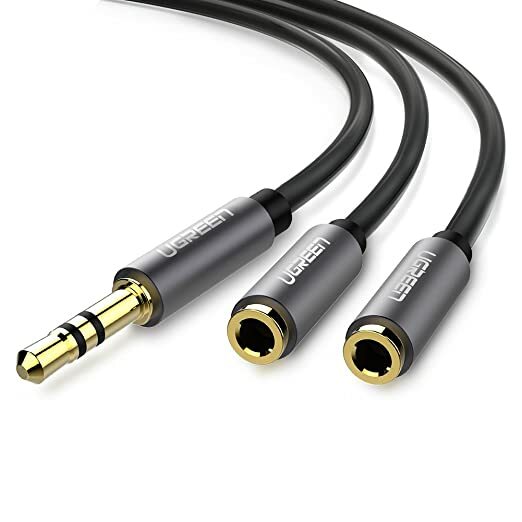 In order to connect a one cord earphones/headphone into two separated Audio/Mic ports, you do need a splitter. Used to working with windows 7 now upgrading to Dragon Naturally Speaking pro 15 on Windows 10, I was not able to start up the program. 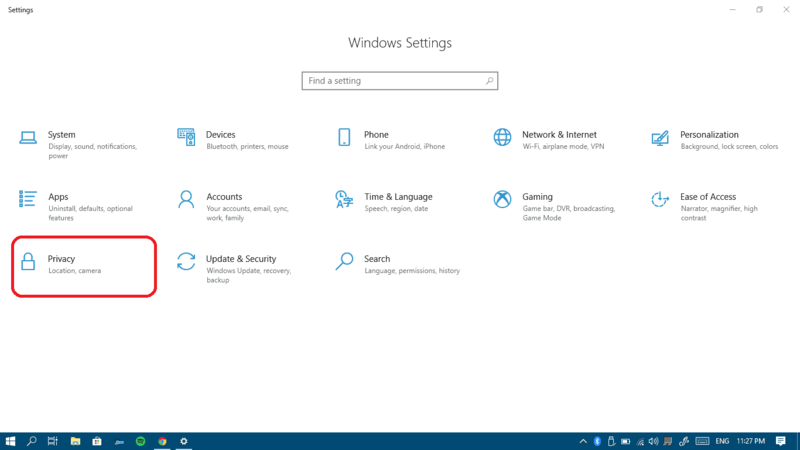 The privacy settings kept me from using Dragon Naturally Speaking 15 on windows 10. After hours lost searching and switching all kinds of headsets /microphones – looking for a hardware / software update solutions, yours was the one. Hello Jean Marie, you’re always welcome! We are glad we could help. Oh that’s very kind of you to say. We are glad we could help and enrich people like you with Knowledge, Situs. Have a great day! I’M REALLY HAPPY I PUT TIME INTO RESEARCHING HOW TO FIX THIS PROBLEM. THE VERY FIRST FEW STEPS HELPED ME GET MY MIC WORKING AGAIN. THANK YOU SO MUCH FOR THIS GUIDE!!!!! Always welcome Hisham! It’s always my pleasure to help you! Have a great day and year man! Excelente, me ayudo en mucho en la activación del microfono, windows 10 me lo tenia deshabilitado. Posteriormente en la configuracion de los decibeles del microfono fue de mas ayuda pues no escuchaba nada de lo que hablaba. Once you have it, reply with the model and I’ll redirect you to the optimum audio driver. Maybe it will work this way let’s try it. hi! i have a 3.5 mm jack microphone and it doesn’t work on my pc . My motherboard is Gigabyte B85M-DS3H-A and i checked my mic and it worked on my phone and laptop. And i have custom pc. Please help me i cant communicate while playing games and im in a disadvantage. Please help me!!! Hey ProAmX, did you try installing the latest audio driver from this page? Choose which operating system you have and then download/install the audio driver. Give your computer a couple of restarts and let’s see if it works again. Good luck! Hi! I have a 3.5 mm jack mic and it doesnt work on my pc. My motherboard is Gigabyte B85M – DS3H – A and i have custom pc. I tried reinstalling the audio driver of my motherboard (latest version) but still it doesn’t work and the driver name is Realtek High definition audio. Please help me!!! Thank you so much for this article 🙂 Since my mic stopped working I tried a lot of things, from re-installing drivers up to actually buying a new headset. Several settings etc. but it didn’t come to my mind checking the privacy settings inside Windows. Voila ! Now all works fine. Hey Maik, you’re always welcome ☺ I’m glad I could help you! Don’t hesitate to come to our website whenever you have an issue. Have a great day! Thank you, this finally solved my problem, damn it was annoying. Apparently it was the privacy settings that kept the mic from working. You’re so welcome ☺ I’m glad I helped! 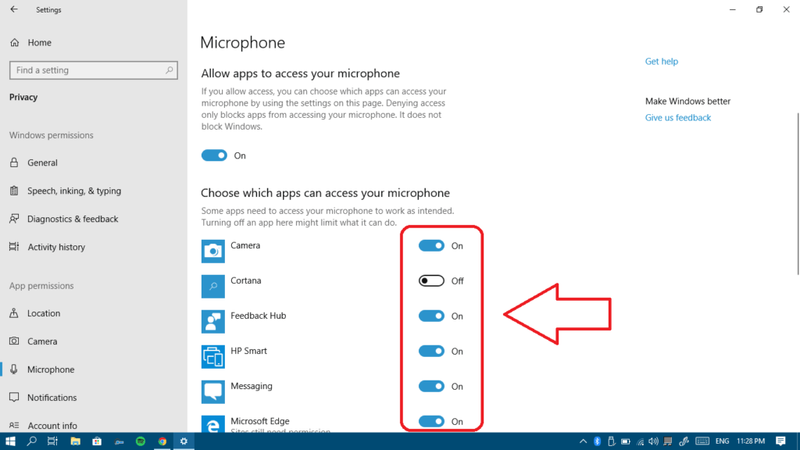 Microphone works only for programs from the list and still does not work for OTHER programs! Hello Alek, you mean the list in the Microphone permissions? I’m afraid any program that’s not in that list won’t be able to get access to your microphone yes. I would suggest that you update Windows 10 to the latest version and re-install the apps you’re talking about. 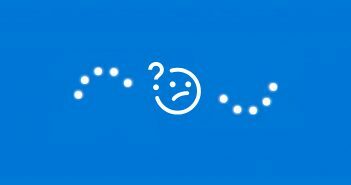 Also send me the name of these apps so I can make some research and tell you if I reach something helpful. Good luck! Hey I have tried everything you stated here nothing works and I have z170 asus pro gaming I tried uninstalling and reinstalling audio drivers nothing works for me. I can hear my friends but they cant hear me my microphone doesn’t work anywhere. didn’t change any settings very strange. 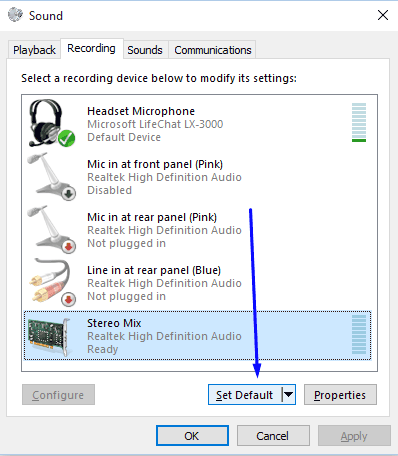 I have found that if you go to Control Panel>Sound>Recording>Microphone Properties and set the Default Format to 2 channel, 16 bit, 44100 Hz (CD Quality) and uncheck Enable audio enhancements, the microphone on any webcam in Windows 10 will start working correctly. Hey Scott! Thanks so much for your contribution. Unchecking the audio enhancements definitely helps but I’ll check the default format and add it to the article. Hello Alisha, we always redirect our readers to download any driver or program from their official website, we don’t force anyone to download anything or such a virus. The article you’re commenting on itself doesn’t have any downloads anyway. Hello Aless, I feel like it’s either a hardware issue or you have another recording device that’s set to be the default one. Therefore, please make sure you disconnect any other recording devices, any webcam maybe and disable all other ones from the recording devices list. Also, try another microphone and try the old ones on another computer to make sure it’s not a hardware issue.